Beautifully presented interior with spacious rooms ideal for a comfortable family holiday. Situated in the centre of the vibrant village of St Merryn, 8 Jubilee Close is a modern detached home set within an easy walk of the village amenities. The ‘seven bays for seven days’ – a beautiful stretch of coastline is just a few miles distant. The accommodation is modern internally and offers a comfortable place to stay, ideal for families with four bedrooms and three bathrooms. The two main bedrooms have en-suite and the master bedroom has a balcony which overlooks the countryside and has distant views to the sea. Two large reception rooms serve the ground floor and the kitchen offers a full suite of appliances. The dining area overlooks the garden which is enclosed and suitable for dogs, which are welcome at 8 Jubilee Close. If required dates are blocked in calendar, please call to check availability. French doors to the back garden – three comfy sofas. Television with freeview. Modern kitchen comprising built in appliances including an electric oven and grill, four ring gas hob, dishwasher, washing machine, fridge/freezer. Seating area with built in bench seating. Rectangular dining table with eight chairs, sofa, sliding doors to the garden. Bath with shower over, toilet, sink, heated towel rail. Double bed, chest & chair. Thermostatic shower, sink, toilet, heated towel rail. Double bed, wardrobe & chair. Ideally a children’s bedroom with two single beds, built in wardrobe, chest. Double bed, sofa, sliding doors to the balcony. Chest and built in wardrobes. Bath with shower over, sink, toilet, heated towel rail. Enclosed garden with patio area and lawn. The garage will accommodate a small to medium sized vehicle. Further parking for one vehicle on the driveway. Dogs are permitted within the property upon request. 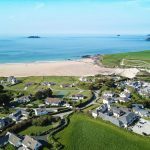 St Merryn is the perfect village for a holiday, centred between seven sandy beaches and offering amenities to include a pub, restaurant, convenience store and bakery. 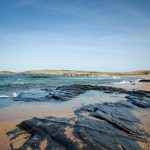 It is Perfectly situated amidst the popular bays of Trevone, Harlyn, Mother Ivey’s, Constantine and Porthcothan, the harbour town of Padstow and the award winning Trevose Golf Club which is just a mile away. 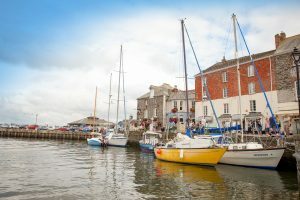 Five minutes away is Padstow, a striking harbour town offering everything you need all in one place… Stunning coastal walks, gourmet restaurants, galleries and shops, beaches along the estuary, sea life safaris and speed boat trips, and of course as many pasties, ice creams and fish and chip shops as a town can fit! 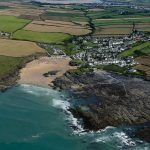 Trevone is lucky enough to have not one but two beaches! A sandy beach, great for surfing and families, with a sheltered aspect tucked between the cliffs. And just around the cliff edge there is a rocky beach, perfect for exploring, you’ll not only find some great rock pools but a large natural pool perfect for a splash! Dogs are permitted out of season. Parking, beach cafe and toilets located at the top of the beach. 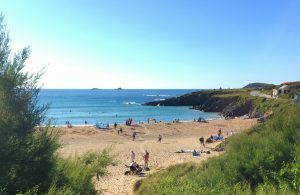 A huge expanse of sand, Harlyn is a great day out with the family offering a brilliant surfing and watersports school. Dog friendly all year round. The Harlyn Inn is just over the road, seasonal burger van and car parking at the top of the beach and toilets just down the road. 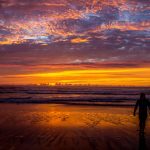 An excellent surfing beach, the bay has rock pools to the left and sand dunes to the right and gentle headland walks in either direction. At low tide it connects with it’s sister beach, Booby’s Bay, giving a stretch of more than half a mile of golden sand. Toilets and a pop up coffee van available, a small amount of parking available by the beach and a larger car park within 100 yards. Dog friendly all year round. 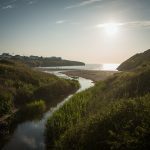 Nicely positioned between Padstow and Newquay, Porthcothan Bay is a sheltered sandy beach which is not far from Bedruthan Steps, offering the most spectacular coastal walks. Parking and toilets are situated on the other side of the road. Dog friendly all year. A stunning surfing beach, perfect for families with plenty of rockpools, caves and a stream running down one side of the beach. 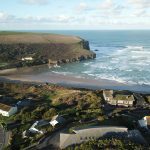 Mawgan Porth has plenty of amenities opposite the beach, a pub, shops, parking, toilets and places to eat. Dog friendly all year round. A simply beautiful stretch of coastline, Watergate bay offers a huge expanse of sand and perfect conditions for surfing and watersports. With the Extreme Academy located on the beach side, there is plenty of activities to get involved in. There is a beach side cafe, restaurant, shop, toilets and parking. Dog friendly all year. 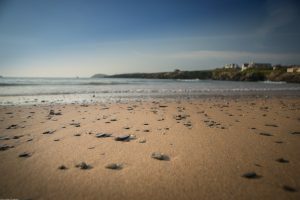 A renowned surfing beach situated in Newquay, Fistral offers a wide stretch of golden sand and an amazing spot for getting in the water. Plenty of places to eat and drink on the beach including Rick Steins restaurant, shops, toilets and parking. Dog friendly all year round. 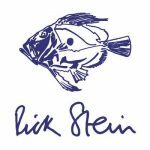 Situated in Padstow, Rick Stein has an array of famous places to eat – The Seafood Restaurant, St Petroc’s Bistro, The Cafe. At the end of the harbour he also has his fish and chips restaurant and take away, a deli and his amazing cookery school. 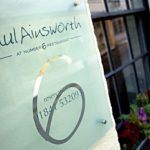 Michelin starred Paul Ainsworth at Number 6 is also located in the heart of Padstow, a real fine dining experience. Paul has a superb Italian restaurant in Padstow – Rojano’s in the Square. Located in Port Isaac you have the two Michelin star Restaurant Nathan Outlaw, a very memorable dining experience, as well as Outlaw’s Fish Kitchen. Nathan also has The Mariners which is in Rock, all three are a must whilst you are in Cornwall! 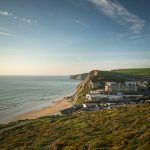 Over in Watergate Bay is Jamie Oliver’s Fifteen restaurant, where you can have not only a beautiful meal but enjoy the most stunning views over the beach.